Dromid Pearses’ hopes of carrying on the great tradition of Kerry Clubs in the Munster Junior Club Championship stretching back to 2008 were dashed at the Mallow GAA complex today when Cork champions Knocknagree came good in extra time to defeat the Kerry representatives. Arguably the Cork side were the better side but Dromid will rue some very costly wides throughout the game and they will certainly be kicking themselves to let the winners in to equalise in overtime and send the game to extra time. The Cork side had two early points on the board and could have had a goal as well inside the opening three minutes but when the goal came it came at the other end with Chris Farley reacting first to the loose ball when Niall O’Shea seemed to be fouled in the square in the act of kicking. Dromid had a lot of play in that opening quarter or so but three wides, good blocking down by the Knocknagree defence and loose passing meant the sides were on level terms after 20 minutes, 1-1 to 0-4 with the Cork side taking the majority of their chances. The game burst into life in the final five minutes of the half when the Knocknagree goalkeeper Patrick Doyle failed to clear and Gearóid Jackie O’Sullivan took advantage and netted. The sides swapped two points apiece between that and the break at which stage Dromid led by 2-3 to 0-7. Matt Dilworth and Eoghan McSweeney pointed on the resumption to level the game within minutes of the restart but scores then dried up with both sides guilty of some poor wides. Niall O’Shea and Anthony O’Connor – who was a thorn in Dromid’s side all through – swapped points and the sides were still level 2-4 to 0-10 with ten to go. The sides swapped points twice in the next eight minutes but then in the 62nd minute Keelan Farley cut in from the left and fisted over the lead point with seconds to go. Dromid found it hard to win a kickout all day and again they were on the back foot from the restart and the Cork champions worked their way down field to get a late late equaliser that hopped on the crossbar and send the game to extra time with the sides deadlocked; 2-7 to 0-13. Dromid also lost Shane O’Connor to a Black Card in that final move. Dromid dominated the 1st period but had three wides, missed a clear goal chance (one from which they should have got at least a point) and while they did have points from the two Farleys and Niall O’Shea to one in reply from Anthony O’Connor, just on the call of time, O’Connor , who finished with 1-7 (0-6 frees), finished the ball to the net at the far post after a good run and shot by Paul O’Connor to leave Knocknagree ahead against the run of play by 2-10 to 1-16 at the break. Again the Cork side started well and had two quickfire points and that was a three points advantage that proved too much of a gap to bridge for Dromid as play became scrappy with each side losing a player and there was no way back for the Kerry champions. Scorers Dromid: Niall O’Shea 0-5 (0-2 frees), Gearóid Jackie O’Sullivan and Chris Farley (0-1 free) 1-1 each, Keelan Farley 0-2, Shane O’Connor and Aidan Shine O’Sullivan 0-1 each. Dromid Pearses go in search of Munster club championship glory on Sunday next when they travel to Mallow to take on the Cork representatives Knocknagree in the Munster Junior Club football final. This competition has been particularly good to Kerry clubs – they have won twelve of the fourteen finals played – and of course Dromid have been down this road before in 2011 when they were crowned champions before exiting controversially at the semi final stage. 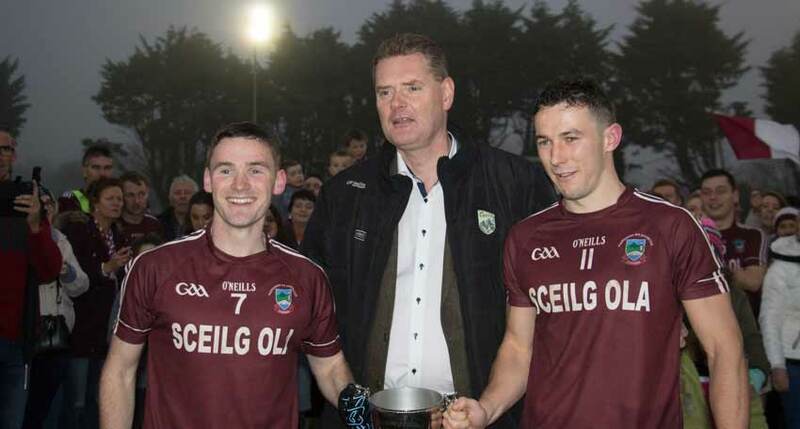 By no means did Dromid have it all their own way when winning through to the Kerry final; They had three points to spare over Renard in Round 1 and were then put to the pin of their collars before pipping Fossa by a single point in the quarter finals. They did have a good nine points to spare over Skellig Rangers in the semi final and then survived extra time against Firies in the final to win by four points. They had a good workout against Naomh Eoin of Clare in the opening round in Munster but then very nearly came a cropper against an unfancied Galtee Gaels in the semi final and that on home soil where they had to pull out all the stops in extra time to defeat the Limerick representatives. Dromid’s experience of this level of football will be invaluable to them against a Cork side who have been very impressive in both Cork and Munster action thus far – their two games in Munster have also been in Mallow – and only a top class performance will do if they are to add another Munster title to their collection. The game throws in at 3:15, it will be refereed by Alan Kissane (Waterofrd) and it will be preceded by the Munster Junior Hurling Final between Ballybacon-Grange (Tipperary) and Ardmore (Waterford) at 1:30.